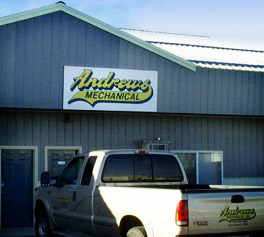 Andrews Mechanical - Welcome to Andrews Mechanical, Inc. Welcome to Andrews Mechanical, Inc. The Northwest's finest and most comprehensive Heating, Ventilation, Air Conditioning (HVAC), radiant heating and cooling, commercial refrigeration, plumbing and process-piping solutions company. Since 1989, Andrews Mechanical, Inc. has provided the greater Spokane region with the highest quality product and support available with an unmatched warranty for all service performed. The Dryerbox is a UL classified metal receptacle that installs in the wall behind the clothes dryer. It safely and efficiently collects the flex transition hose, allowing the dryer to be installed flush against the wall. Eliminating the bends in the flex exhaust hose provides for better, less restrictive airflow, which in turn minimizes lint buildup, saves energy costs and reduces the serious fire hazard caused by lint buildup.